Non-surgical therapy removes plaque and calculus by controlling the growth of harmful bacteria and by treating conditions that encourage gum disease. Along with effective personal oral hygiene allows the gum tissue to heal and reattach to the tooth. 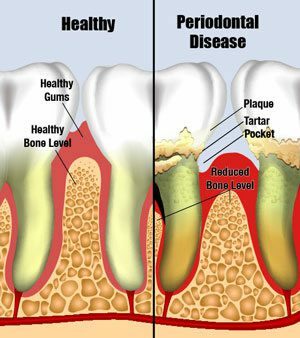 Four to six weeks later, periodontal pockets are notably reduced due to gum shrinkage (if the disease is in its earliest stage), then the patient can personally maintain these areas with routine brushing and flossing (and any other recommended homecare routines). This type of treatment may be all that’s needed, especially when periodontal disease is caught early. You may also need to have certain procedures, such as replacing worn fillings or crowns with overhanging margins that can accumulate plaque, taken care of before periodontal therapy can begin. Even in most severe cases of periodontal disease, non-surgical periodontal therapy most often precedes surgical therapy. This is done so that the active periodontal infection is reduced and the overall tissue quality is improved prior to surgery. Non-surgical therapy may also limit the areas requiring surgery. Scaling is a type of cleaning that removes plaque and calculus from the teeth at and slightly below the gumline. Root planing smoothes root surfaces, so the supportive tissues can better reattach to the tooth surface. Often, this will be done with local anesthesia so you can relax and feel nothing as we rehabilitate your gums. Periodontal disease is a bacterial disease and the key to controlling or eliminating it is the effective reduction or elimination of the harmful bacteria. An adjunctive option to scaling and root planing may be provided in either pill form or applied directly to the infected area (gum pocket) in the form of antibiotic strip. An improper bite or a traumatic occlusion may increase bone destruction attached to such offending teeth. We may recommend to adjust your bite so that your teeth meet properly and function better, braces, or construct a custom bite guard or splint to protect teeth surfaces and relax tense jaw muscles.